OSCEOLA, Ark. — Funeral arrangements have been made for the Mid-South father and son killed in the duck boat that capsized in Missouri. Steve Smith, 53, and 15-year-old Lance Smith were among the 17 people who died. They were on their annual family trip to Branson from Osceola, Arkansas. “He said 'It’s not good, Pam.' And I told him I loved him, he told me he loved me and I told him to take care of the kids." Steve and Pam Smith's 14-year-old daughter Loren was also on the boat. She survived. She says what started as a blue-bird day, turned into a sky full of clouds she describes as evil. As murky water flooded their boat, she fought to make it back to land, not knowing she’d be the only one in their family to do so. Pam and Steve had been married nearly three decades. Their family makes the five-hour trip from Osceola to Branson every summer. Their family’s well known in the community as educators and church-goers. They say they’re going to need a lot of prayers to get through this tragedy. 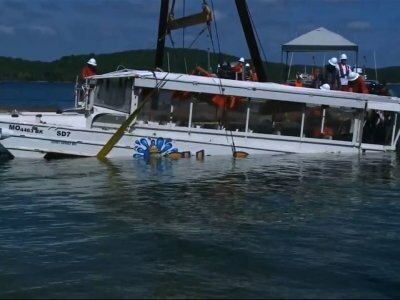 On Monday morning, the sunken boat was raised from Table Rock Lake and pulled to shore. The website for a tour company whose boat capsized in Missouri says the business is offering to pay for medical and funeral expenses for those aboard. Thirty-one people were on the amphibious duck boat when it capsized Thursday evening on choppy waters during a storm. Seventeen died. The National Transportation Safety Board and other agencies are investigating. The website for Ride the Ducks Branson says the company is offering to pay for all related medical bills and funeral expenses, to return all personal items from the rescue scene, and to help with any related travel or accommodations that families need. The company also says it’s providing grief counseling for its own employees. The page says the company’s leaders remain deeply saddened, but the company cannot comment further on orders from the NTSB. The boat , which was submerged in 80 feet of water, went down Thursday evening after a sudden thunderstorm generated near-hurricane strength winds. Nine of the people who died belonged to one Indiana family . Others killed came from Missouri, Arkansas and Illinois. Seven survivors were taken to a Branson hospital, where the last patient was discharged Sunday. Mandi Keller, who was not aboard the vessel, told The Kansas City Star that the survival of her 15-year-old daughter, Gillian Collins, and eight other relatives was a “complete miracle.” They were the only family aboard in which no one died. Missouri State Highway Patrol chaplain Steve Martin said the family’s survival was “remarkable” and that there is no explanation for it. He said the relatives, who found safety in different ways, were suffering from survivors’ guilt. Divers have recovered a video-recording device that was aboard the boat, although it’s unclear whether it was working when the boat capsized or whether any data can be retrieved, including audio. The recorder was headed to the NTSB lab in Washington, D.C.
Former NTSB Chairman James Hall said over the weekend that the World War II-era duck boats should be banned for commercial recreational use because they aren’t safe in bad weather. Steve Paul, owner of the Test Drive Technologies inspection service in the St. Louis area, said he issued a written report in August 2017 for Ripley Entertainment, which owns Ride the Ducks in Branson, after inspecting two dozen boats. In the report, he explained why the vessels’ engines — and pumps that remove water from their hulls — might fail in inclement weather. Ripley Entertainment, which owns the duck boat business in Branson, has not responded to questions about Paul’s concerns. The company’s website said it was offering to pay for all medical and funeral expenses for victims, to return all personal items from the accident scene and to help with families’ travel or accommodations. The company also said it was offering grief counseling for its own employees. Ripley has made few comments since Friday, except to say that the accident was the company’s first in more than 40 years in Branson.